ChiroPlus Wellness Care delivers patient centered, holistic and natural ways of healing the body. Dr. Eric Choi is extensively trained in treating acute/chronic pain and related ailments as well as metabolic related conditions. With Chiropractic, Acupuncture and functional medicine expertise, Dr. Choi is able to address your health concerns with individualized patient care that is tailored to target patients wellness goals. Dr. Eric Choi also emphasizes preventative care and improving health by educating patients to enhance the awareness and current researches to stay on top of his patients ongoing care. He uses highly effective chiropractic techniques supported by clinical trials and researches to help patients stay healthy, avoid illnesses and future injures as well. Dr. Choi uses a combination of various modalities such as acupuncture, dry needling, functional medicine approach, clod laser, Graston Technique and spinal decompression therapy to help relieve patients pain and bring them a higher quality of life. Services ChiroPlus Wellness Care offers variety of services. For pain and injuries, we offer Chiropractic, Acupuncture, cold laser therapy, spinal decompression therapy, cupping, Graston technique, and massage therapy. Dr, Eric Choi is also extensively trained in functional medicine/clinical nutrition as he is passionate about delivering optimal health by investigating patients inner/organ systems via blood test and other functional test that reveals potential problems, otherwise maybe hidden. Some the the functional health issues he can address include but not limited to metabolic related issues such as weight problems, fatigue, sleep disturbances, hormonal related issues, blood sugar metabolism, vitamin/mineral deficiency, immune challenges, digestive concerns, cardiovascular health, mood related symptoms, optimal detoxification and more. Dr. Eric cares deeply for his patients. Listens and works with and for you. Would recommend him. For 20years I have experienced low back pain and multiple trigger point areas of my back and legs. After my total hip I became worse with severe pain of my lower back and hip area. 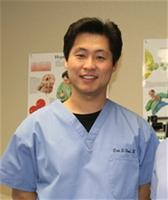 After one visit with Dr. Choi I felt like a new person and now after 3 weeks I feel like I am in a new body. Dr. Choi's hollistic approach is so refreshing. After taking a comprehensive history and just taking time to talk, he has identified other areas of concern that I have had for years i.e. nutrition and how foods determine health and wellbeing. Wouldn't you like to wake up everyday feeling great? Please visit Dr. Eric Choi.